Not much time to blog folks, so please excuse my brief description of a complex situation. Denver is a complete police state, and I say that without exaggeration. The sheer number of law enforcement officers is easily more than the amount of protesters. Due to the outright promise that protesters in Denver will be beaten, arrested, and locked up in a Gitmo-style warehouse, the numbers aren’t as large as expected. However, there seems to be a strong group of Anarchists who refuse to be intimidated. Today we demonstrated on a blocked off route, but soon moved into streets which weren’t designated areas. We completely stopped traffic as we moved between honking cars and dance in intersections. Giving credit where credit is due, the police were actually pretty tolerant until we started blocking streets near the capitol building. Officers in riot gear, holding their batons and rubber bullet guns, moved in on us. Two people were singled out and arrested but we stood our ground. An Update From the DNC – The Largest Minority. This is more a Call to Action than a typical commentary. We need your video responses, even if you have nothing to say other than “I support open debates”! That’s fine. Anything is better than silence. 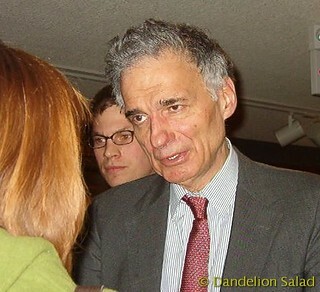 We also need to write Google, Obama, and McCain expressing our demand for Nader to be in the debate, along with any other candidate who reaches 5 percent or more in the polls. Pressure Obama not to slink away from a debate which promises to be more democratic than the CPD debates. Call him out on this one. Below are the three entities for you to contact followed by part of a long-winded article which continues on my website. Google is scheduled to hold a debate independent of the corporate Commission on Presidential Debates (CPD). This is possibly our one and only chance to get Obama and McCain to debate Ralph Nader and any other third-party or independent candidate running for the presidency. We must pressure Google to lower their requirements to 5% before this opportunity is lost. While using exclusionary tactics to silence opposition, these two major parties seem to think that freedom, a term they both speak highly of, means having power for yourself at the expense of others. In 1992, independent candidate Ross Perot, who was polling at 7-9 percent, was included in the debates at the request of George H.W. Bush, who made Perot’s inclusion a precondition for his own participation. Under current CPD requirements of 15 percent, Perot wouldn’t have been admitted today. Fear and demoralization allow us to accept the status of slaves. Express your solidarity with the workers of the world in a comment or video response and declare your independence. Citizen activists converge upon Nevada to help get 2008 presidential candidate Ralph Nader on the ballot in the general election. Visit VoteNader.org to join the road trip for Ralph. Any regular reader of this blog knows that the internet is a horrible place filled with nothing but wild accusations and rumor. The cable news networks are right. Perhaps we ought to leave the irresponsible reporting up to the experts in the corporate media who’ve had a monopoly for decades.